On July 17th the cruise ship Queen Victoria visited the port of Kiel for the first time. 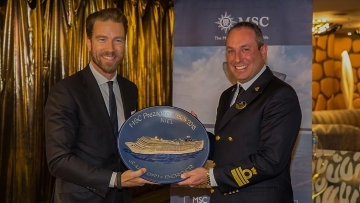 Jens B. Knudsen presented an engraved tin plate from Sartori & Berger to Captain Simon Paul Love at the plaque & key ceremony. We wish the ship, its guests and crew a safe journey at all times and look forward to a return to the Kiel Fjord next year. We look forward to the growth of the Color Line fleet. As of January 2019 an additional freight ferry will be operated on the Oslo-Kiel route. 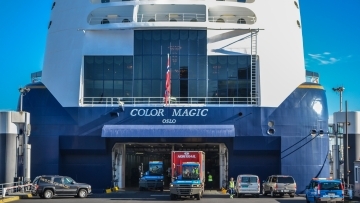 In addition to the daily ferry departures of the Color Fantasy and Color Magic the approximately 155m long freight ferry will be handled three times a week by our stevedoring as well as our freight and forwarding department in Kiel. 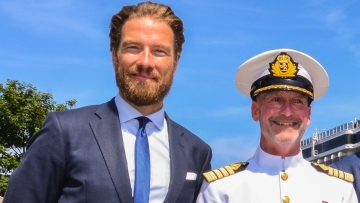 On Wednesday, Viking Sun called the Port of Hamburg for the first time in fantastic weather. 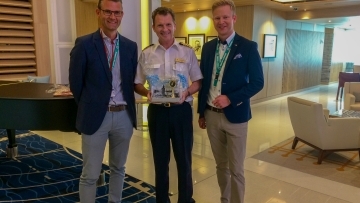 As a greeting, our port- and cruise agents Ole Klinger and Timo Kaden presented a small engine room telegraph to Captain Olav Soevdsnes. During the port call, our stevedoring team took care of the provisioning. The museum cargo ship also offers this year many voyages in North Germany again. 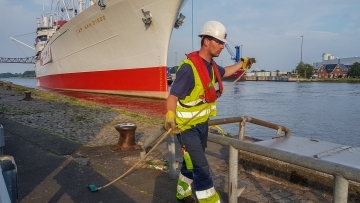 Last weekend, the Cap San Diego sailed from Hamburg to Cuxhaven, Rendsburg and Kiel. The crew as well as the arriving and departing guests of the short trips on site were supported by Sartori & Berger’s employees, they organized busses and provided the staff for mooring and unmooring, e.g. in the district port of Rendsburg or at the “Kieler Seefischmarkt”. We look forward to many more visits! 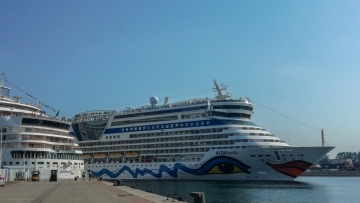 Actually, only AIDAmar was scheduled for Warnemünde on Saturday. However, due to low water AIDAbella was unable to call the port of Copenhagen and instead made a stop at our Rostock colleagues in Warnemünde. By the way, our Hamburg office was in charge of a planned double call of AIDAperla and AIDAsol. On 1st of June 2018 we celebrated the 25 years jubilee of the Rostock branch office in the city harbour of Rostock. Jens B. Knudsen welcomed 70 guests under blue skies and brilliant sunshine. We like to thank Mr. Felix Eichhorn (President AIDA Cruises) and Mr. Gisbert Ruhnke (Port Captain Rostock) for their kind greeting words. 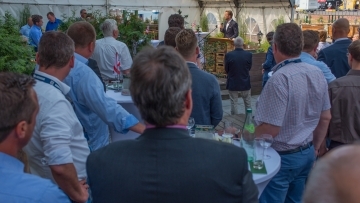 Jens B. Knudsen thanked the clients and business partners for the past 25 years and gave an outlook to the future developments of the Rostock branch office. 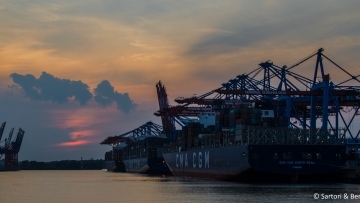 At the turn of months May and June two large container vessels of the French shipping company CMA CGM visited the Burchardkai at the port of Hamburg. The CMA CGM Corte Real (365m long and 51m wide) arrived on Thursday morning and left after cargo operations on Friday noon. Thursday evening berthed also the CMA CGM Zheng He, 398m long and 54m wide, which stayed even two nights at the port. Both ships were handled by the agents of Sartori & Berger. 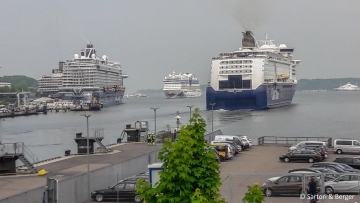 In addition to 2 ferries, 4 large cruise ships called the port of Kiel on Whitsun Saturday. Besides the premiere of MSC Preziosa in the Ostuferhafen, AIDAluna also celebrated her premiere at the Norwegenkai. 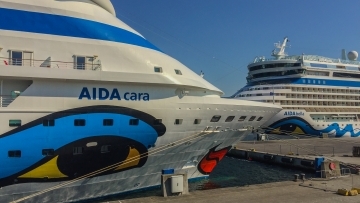 It seems as if AIDAcara and AIDAbella “kissed” each other in the port of Kiel. Two teams of our hostesses and port agents took care of passengers and crew. 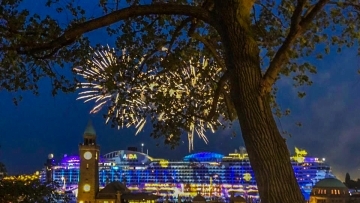 From 10th until 13th May 2018 the 829th Harbour’s Birthday was celebrated in Hamburg. On all days our team was involved in the port agency and in the ground and luggage handling for numerous ships. After a long trip from South America MSC Preziosa called its new base port for the summer season on Saturday. This was the first time that the largest cruise ship so far in the port of Kiel moored here. 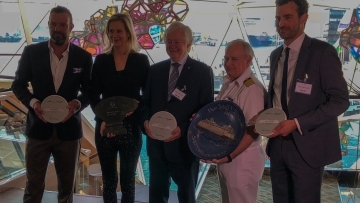 On this occasion Jens B. Knudsen presented the traditional plate from Sartori & Berger to Captain Stefano Aiello at the plaque & key ceremony. Even before the christening, the new “Mein Schiff 1” visited the port of Kiel on April 27th as part of a “pre-cruise” after leaving the shipyard. To welcome the youngest fleet member the traditional plaque & key ceremony took place on board.